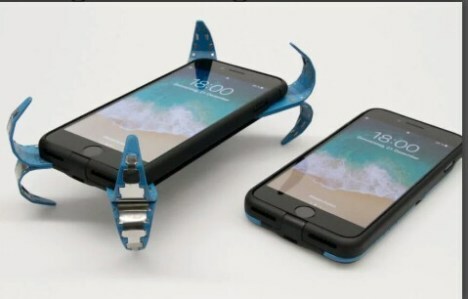 A German student by the name Philip Frenzel has developed a new phone casing which he called “Active Damping Case” (Adcase) for short that help to prevent your phone from damage. His new invention consists of an eight legged spider looking horns that spring out when you drop your phone. The young engineer at Aalen University in Germany has already won a top award from the German Society for Mechatronics for his idea. The design, though still a prototype shows eight thin metal curls that normally lie flat inside the case. This metal curls pop out and curl up in opposite directions, protecting the edges of the phone from impact. This will help protect your phone screen from damage when it hits the floor, or any concrete surface. This spider looking legs can easily be folded back into their holsters when you pick up the phone. 0 Response to "German Student Invents Phone Casing With Pops Out Legs "